The squad for the two-match Test series against West Indies included a number of new faces like Prithvi Shaw, Mayank Agarwal and Mohammed Siraj, but one name missing in that list was Rohit Sharma, laments former offie Harbhajan Singh. To him, the right-hander, who guided India to the Asia Cup 2018, being not part of the squad is unacceptable. But there is another player whose omission everyone should feel sad, more sad for the comments made by a member of the Selection Committee !! .. the selection committee consists of 5 members and a convenor. Only the 5 members of the selection committee have voting rights on team selection. The convenor is the Secretary, BCCI for the senior selection team and Jr. Secretary for junior selection team. The 5 members in the selection committee were traditionally selected from the 5 cricket zones – North Zone, Central Zone, West Zone, East Zone, South Zone. One of the 5 members is selected by BCCI as the Chairman of the selection committee. Under pressure from the Lodha committee recommendation, the BCCI scrapped the zonal system in 2016. The Captain and Coach are invited to the selection committee meetings to present their opinions on team players though the captain and coach don't have voting rights in team selection. Way back in Feb 1972 at Kingston in the 1st Test WI made 508/4 decl and the match was drawn. Roy Fredricks (163) opened with Mc Carew (43)- Lawrence Rowe made his debut hit 214. In a career spanning 8 years, he played 30 tsts making 2047 runs with a triple hundred. He was part of that rebel tour to South Africa, when Pretoria had been banned for the apartheid regime. It was organised and conducted without the approval of West Indies' cricket board. Such tours were in fact outlawed by cricket boards over the world, by governments including the government of Jamaica and by other international organisations like the United Nations. Jamaicans were clearly upset - life wasn't easy for Rowe after that fatal tour. There were reports that he would hide in the Kingston club to watch Tests in Sabina Park. There was anger in the air. Time is a healer. Years later in 2011, Lawrence Rowe was honoured by the Jamaican Cricket Association (JCA) by dedicating a stand after his name at the Sabina Park. He chose the moment to apologise for his past conduct that had angered and upset the Jamaican population to the extent that the right-hander had to leave the Caribbean and settle in the United States. Incidentally, he did not play in 1974-75 tour to India – perhaps that allowed Alvin Kalicharran and Viv Richards to get a place and prosper. Read that he was sent back home for treatment of a stye on his eyelid, he was discovered by an ophthalmic surgeon to have eyesight better than 20-20, and could read the maker's name on the optical chart. But he also had teryginum, a disease involving vision-blurring growths: they had almost completely covered his right eye and were on the way to obscuring vision in the left. "Communication has always been the strong point of this committee," MSK Prasad is quoted as saying !! "It's really tough to inform any unpleasant news to any player. You need to have valid reasons to explain them about their exclusion though they may not agree with it. "Having said that, we are very clear and candid in our communication process. 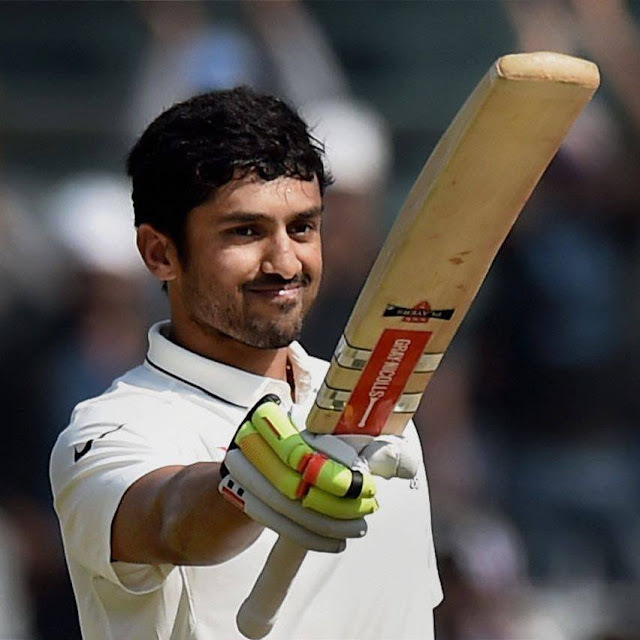 My colleague Devang Gandhi spoke to Karun Nair at length in England to keep him motivated and wait for his opportunities." After controversially dropping Karun Nair from the Test squad, even though he didn't get a chance to fail or succeed for six straight Tests, India's chairman of selectors MSK Prasad has given the batsman an advice: "keep on piling runs" in the domestic circuit and for India A. Prasad also clarified that he had personally spoken to Nair after leaving him out of the 15-man squad for the West Indies series at home. Nair's omission created a stir because he was given no opportunity to prove himself on the preceding England tour and the lone Test against Afghanistan at home. One cannot be more cruel to an aspirant Cricketer !!. Cricinfo further adds that - "I personally spoke to Karun soon after the selection of the Test team against the West Indies and also told the ways to make a comeback. The selection committee is very, very clear with regard to the communication process," Prasad told PTI. "He will have to keep on piling runs in Ranji Trophy and whatever India A series is there. Karun is very much in the scheme of things for Test cricket. Right now, we have advised him to focus on performing in domestic and India A matches." For the records, Karun Nair has played in 6 tests – in his debut test at Mohali he made 4, followed with 13 at Mumbai – in his Third test in Chennai, in the final day, he made a delightful 303* on 16.12.2016 joining the illustrious Virender Sehwag as the only other Indian to make a triple century. He was to play another 3 test innings making 26,23 & 5 – before being asked by the present selector to make more runs in Ranji and make a come back !! For the uninformed, Donald Bradman, Virender Sehwag, Brian Lara & Chris Gayle are the ones to have 2 triple tons to their credit. Of the few who have a test 300 – Karun Nair stands tall as he is the one there with the least matches. A Sandham who last played in 1930 is there with 14 tests; RM Cowper with 27 and LG Rowe with 30 tests are the ones who have a triple ton in less than 50 tests. Lodha committee provided recommendations that the Supreme Court of India ordered the BCCI to implement. One recommendation was to have scrap the zonal system and appoint 3 national selectors who would all be Test players retired for a minimum of 5 years. The BCCI was thus forced to finally scrap the zonal system in Sep 2016, advertising for applications and using personal interviews to pick the selectors. However the BCCI differed from the recommendation in picking 5 selectors and in the eligibility criteria (allowing for ODI and first class experience also). Cocah Ravi Shastri is one the votaries of 5 selectors. The present Selection committee comprises of MSK Prasad (Chairman) (6 Tests 17 ODIs); Devang Gandhi (4 & 3); Sarandeep Singh (3 & 5); Jatin Paranjpe (4 ODIs) & Gagan Khoda (2 ODIs). MSK Prasad the wicket-keeper from Andhra made 106 runs in 10 innings and 131 in 11 ODI innings. Devang Gandhi failed in the tour of Australia against short balls. In 4 tests, he made 204 and 49 in 3 one dayers. ~ and the selectors want Karun Nair to play more Ranji, make more runs for getting a place in the Test squad. Sad is the state of affairs. One feels sad for Karun Nair.